Savage CBD is a company on a mission to help people with medical issues obtain relief. By harnessing the power of safe hemp-derived CBD products, this brand believes in helping those suffering from ailments to restore balance in their lives and improve their quality of life. Savage CBD believes firmly in the many health benefits that have been associated with using CBD and strive to continue taking their business to the next level to produce cutting-edge, high-quality products. 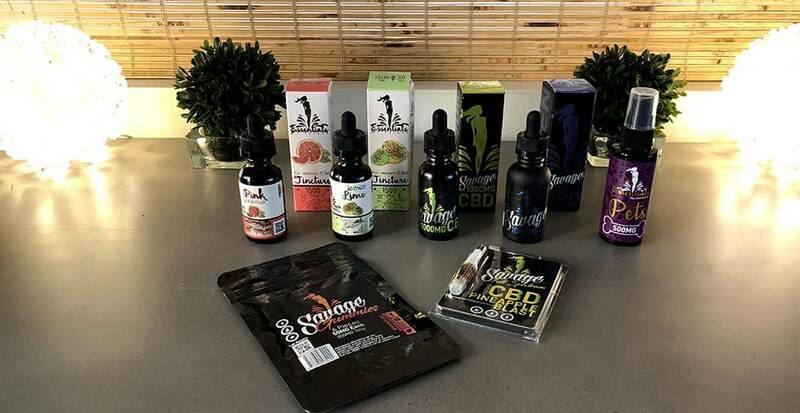 Savage CBD’s range comprises a wide range of hemp-derived products including edibles, vaping products, sprays, and tinctures as well as products aimed at pets. With full independent lab testing results available to be viewed on their website, Savage CBD is a reliable choice if you’re looking for safe and legal products since the level of CBD in their products can be confirmed and it can be proven that there are no pesticides or contaminants in them. Savage CBD’s Essentials by Savage range comprises of Full Spectrum CBD products. The Essentials line is composed of two flavors of tinctures, as well as soft gels, a lotion, a vape cartridge, and a pet spray. Of these, the two Essentials tinctures are especially effective and are a popular choice among those who are keen to benefit from CBD’s potential health benefits in a convenient and fast-acting way. There are two flavors of tinctures to choose from in the Essentials by Savage line. Either would be a perfect choice for anyone who is keen to take advantage of CBD’s potential health benefits without having to put up with an unpleasant or acquired taste. The best thing about these tinctures is that they both have truly impressive flavor. The lemon lime variety really does have all the citrus kick of real lemons! You can either use it sublingually for a rapid effect, add it to a drink or even to food. It is an ideal additive and with its blend of terpenes, essential oils, and full spectrum CBD, it’s a truly enjoyable way to enjoy this health-giving product. The pink grapefruit variety is our personal favorite. It is equally impressive and has a tangy, delicious taste. It, too, can either be taken sublingually or can be added to drinks or food for a convenient way to administer CBD. Another popular choice from the Savage CBD range is their delicious CBD-infused gummies. For some users, the idea of vaping CBD oil or using a tincture under their tongue really doesn’t appeal. For those people, edibles are a perfect alternative and gummies are an especially delicious choice. While some CBD-infused gummies have an acquired taste and a distinctive “medicinal” flavor, the ones from the Savage CBD brand are especially tasty. Representing an easy and discreet way to get a dose of CBD, Savage CBD’s gummies are incredibly simple to use and can be eaten anywhere to help with relief of chronic pain, stress, and anxiety with no psychoactive high. Savage CBD’s gummies come in a 300mg bag, with each of the six pieces containing 50mg of CBD. This is a high dose compared to other CBD gummies brands which usually have 10mg of CBD a piece. Not only are these gummies delicious to eat, they’re also visually appealing – they look exactly like regular gummy worms in bright shades of yellow, red, green and orange that make them seem even more delectable. If we loved the flavor of their tinctures, we were equally impressed by the flavor of their CBD E-juice and Cartridge. Their e-juice come in 30ml bottles and in strenghts of 250mg, 500mg, and 1000mg. We got to try 2 that have notes of sour razzmatazz – Driven, with candied blueberry flavor and Serene, with candied double apple. Other flavors are Hustle (raspberry cookie), Passion (candied watermelon), Tranquil (mango and coconut), Vape Shot which is unflavored and can be added to any e-juice (only comes in 1000mg). And of course, they also have the Pineapple Blast CBD cartridge which reminds us of being on the beach in Hawaii. We love it and Savage has gained a TON of fans with their e-juice and cartridge. Although there are lots of CBD products on the market, Savage CBD’s range is especially impressive. What we also like is that they have different product bundles that help save on cost. Additionally, not only do they have clear lab testing results displayed prominently on their website, but they are also guaranteed to be entirely GMO, pesticide, and THC free. They offer free shipping within the US and offer Military discount. Users can enjoy all the health benefits believed to be associated with CBD products with no unwanted side effects. Whether users are suffering from anxiety, chronic pain disorders or many other health issues, they often report that they have experienced positive results when using Savage CBD’s products. If you would like to try Savage CBD's products, feel free to use this 25% discount code exclusive to Pure Green Living's readers. I am a very HUGE fan of Savage’s products. While you mentioned that the pink grapefruit is a personal favorite, mine is the lime tincture. It’s versatile since I can mix it with my margaritas or even put a couple of drops on my burrito. My husband thinks it’s weird, but I gotta have me some CBD. For the gummies, we keep it out of our children’s reach. They’re just so yummy that you’d forget that it has something herbal in its mix! I swear by this brand so much, I want to try all that they’re offering soon, cause I know I won’t be disappointed.